How Bad Do Things Have To Be To Get A Tom Brady Head Tattoo? Head Tattoo – St. Petersburg Police Apparent New England Patriots fanatic Victor Thompson, 46, was arrested for possession of ‘spice,’ a synthetic marijuana, in St. Petersburg, Florida. A die-hard New England Patriots fan got busted on a drug charge, but that’s not what got people talking. 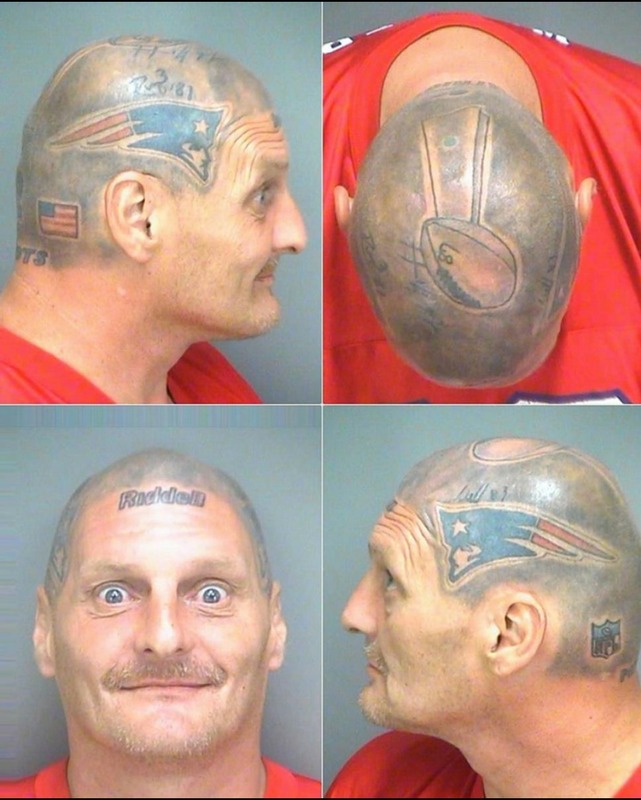 Victor Thompson’s mug shots show he has an image of the helmet of quarterback Tom Brady tattooed across his head. Haven’t heard from Florida in far too long, so it’s nice to see that they’re coming back into the spotlight with a bang. This is a head tattoo to end all head tattoos. Only a crazy, insane person would go through all this trouble to get a Patriots tattoo. On the other end, only crazy, insane people live in Florida, so it does make a lot of sense. When this guy gets released from jail, maybe someone should put a protective detail on Tom Brady. On second thought, maybe we should arrange for this guy to meet Brady. I’m sure nothing terrible will happen. Posted on October 10, 2014, in Average Blog Posts and tagged head tattoo, new England patriots, st. petersburg florida, thompson, tom brady helmet tattoo, victor. Bookmark the permalink. 7 Comments. 3 ώρες και δεν βρήκα πολλά άρθρα που να είναι εξίσου ενδιαφέροντα με το δικό σας. που επισκέπτομαι αυτό το site και με βοήθησε πάρα πολύ στη εργασία μου. Μακάρι να μπορούσα να σας εξυπηρετήσω όπως εσείς εμένα μόλις.